Beginning September 27, you will not be able to send more than 100 SMS in one day. Telecom Regulatory Authority of India (TRAI) has announced Per Day Per Sim (PDPS) rule under which telecom service providers have been asked to withdraw their SMS service packs that allow customers to send over 100 SMS per day. According to TRAI, the move is aimed at preventing telemarketers from bombarding your mobile with unwanted calls and SMS. TRAI's latest move will certainly prompt mobile users to make phone calls instead of sending SMS. Withdrawal of SMS service packs will also hit the pockets of users who get unlimited free SMS by paying nearly Rs. 100 monthly. However, TRAI believes the capping SMS will be the best way to protect the interests of customers. "In case of prepaid users, you can monitor it on a day-today basis but for postpaid customers , you will look at the number at the end of the month," TOI quotes Rajan S Mathews , director general of COAI. The SMS cap comes weeks after TRAI ruled that telemarketers cannot call subscribers registered with the National Do Not Call Registery between 9am to 9pm. Telemarketers cannot call subscribers, who have registered under the “fully blocked'” category. However, telecom regulator has allowed users to access information on selected sectors such as sports, real estate and consumer goods. Short messages are particularly popular among the youth. Presently, all the telecom companies offer SMS service packs, which allow users to send more than 100 SMS daily. These SMS packs are popular for their ultra low prices, which are under Rs. 100. Restriction is likely to disappoint a number of mobile users, especially those who cannot afford smartphones such as BlackBerry. this step by TRAI is certainly welcome... this will certainly help the mobile users relieved from pesky SMSses that good, better talk then SMS... certainly a positive step. we want our freedom back. 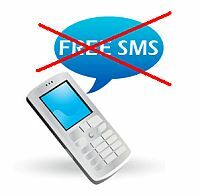 we need atleast 300 sms per day..l.plz trai remove this restriction. We will surely try and find some way out....! !